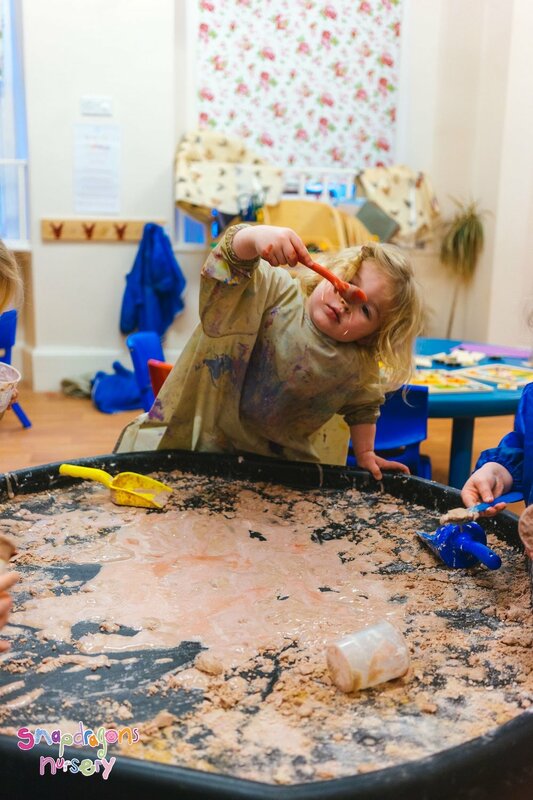 In our new Snapshot series, 'Learn Through Play', we examine the educational methods behind each activity, analysing what the children are learning from their experiences and how it helps them evolve and grow whilst at nursery. This first episode is hosted by one of our Early Years Advisory Teachers, Catherine Bond, as she studies the activities the children enjoyed for January's 'Book of the Month' - The Gingerbread Man. Have a watch of the video or read through Catherine's notes and accompanying pictures. Gloop gives children opportunity to explore materials using their senses. The ginger presented to the children gave them a new powerful scent to experience. Communication and Language development is being supported by the use of the story’s repeated rhyming refrain. As the children join in they are building their attention and listening skills. Early literacy is supported through the growing awareness of the rhythm and pattern involved in story language. Physical skills are being developed through controlling the one handed tools to mix the ingredients together. They are physically exploring the texture of the gloop and learning about the consistency of the thick liquid and how it behaves when poured and dripped through fingers. Making marks using their fingers and tools is providing experience important to the developmental journey from experimentation to subsequent early writing. Forming circles is another important element of this. In this dough exploration these babies are using their developing fine motor skills to control different tools. The process of exploring is as important as the end result of achieving a little Gingerbread Man shape. This particular activity requires them to explore the range of physical movements involved in rolling with rolling pins, cutting with wheels and gingerbread man shaped cutters. The Key Person is helping them to acquire these skills by showing them and guiding their actions, this leads to having a go by themselves as they copy the actions they have seen and experienced. Communication and Language skills are being developed through the staff providing an ongoing narrative for what is happening using a range of descriptive vocabulary. This gives meaning to the words as the child physically experiences the action simultaneously as they press, roll or cut. A roly poly rhyme gives added emphasis to the use of the rolling pins. These older children have refined their physical skills in the use of rolling pins to successfully flatten the gingerbread dough and press down cutters to make a gingerbread man. Their emotional development and well being is boosted through the sense of achievement having a go by themselves provides. The Key Person reinforces the related language throughout. Drawing around a child to create a large scale gingerbread man image requires teamwork with the Key Person and children working together in a small social group. This requires skills of listening and following simple instructions. The Key Person names each body part as she draws around it, and uses language related to the direction of the marks as she makes them such as around and down. This ongoing narrative reinforces children’s knowledge and related vocabulary. The children’s fine motor control is being developed through the use of coloured crayons to mark out the outline. The children were free to explore making their own marks, with all attempts being valued. This is important in encouraging a positive willingness to have a go that will stay with them as they continue to develop both early drawing and writing skills as they progress through the Early Years Foundation Stage. The position of the paper on the floor enables these young children to move more freely without being restricted to a chair and table top, which is beneficial to the flow of their mark making movements at this stage in their physical development. They are motivated to persist with the task, concentrating on what they are doing together. The end result is shared and celebrated together. Outside provides the space to move freely in this running game of chasing The Gingerbread Man. The children’s physical skills are challenged by negotiating their way around the various obstacles in their path in the playground. They are also acquiring the ability to vary and control their speed and direction. Communication and Language development is supported as the children are experiencing listening and following instructions and understanding the concept of stopping and starting. The children are also gaining skills of cooperating in a small social group and following the rules of the game together. The story is experienced in a new way through this very active approach which gives all children the opportunity to access learning in a way that suits them.